Creed II (2018). Boxing sequel comes out with fists up and keeps them there. 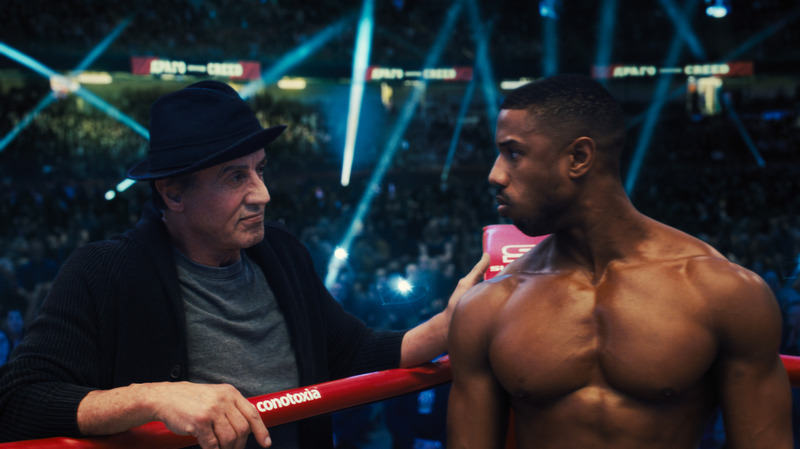 Film review, by Jason Day, of Creed II, the big-fight boxing sequel starring Michael B. Jordan and Sylvester Stallone. Adonis Creed (Michael B. Jordan) has retained his World Heavyweight boxing title, won thanks to the training of his wise mentor and former champ Rocky Balboa (Sylvester Stallone). Marital bliss with his pregnant fiancee singer Bianca (Tessa Thompson) seems assured until a deadly foe from the past, Ivan Drago (Dolph Lundgren) reappears in Balboa’s restaurant. The two fought each other 30 years ago, partly a revenge match as Drago killed Balboa’s foe turned friend Apollo Creed – Adonis’ father – during an earlier bout. Drago wants Adonis to fight his own son, the angry, emotionally neglected Viktor (Florian Munteanu). The Drago’s are damaged goods in their Russian homeland and are desperate for glory. Balboa steps aside to let Adonis step into a dangerous boxing ring, against his better judgement. The first Rocky sequel (imaginatively called Rocky II, 1979) was a rematch even die-hard sports movie fans would struggle to like. After the giddy successes of the 1976 movie (a huge hit, it scooped a slew of international awards, including Oscars for Best Picture, Best Director and nominations for four of its principal actors) a sequel was always going to live in the shadow, but the incessant talk of marriage, setting up a home and having a baby diluted its pugilistic punch. It’s the same format here and I was groaning with annoyance that Creed II was going to make the same mistakes as Rocky II. The first 20 minutes dawdle when they should grip and had me shifting anxiously in my seat, squirming as to how I would last the full two-hours-plus duration. Big match, little love story. 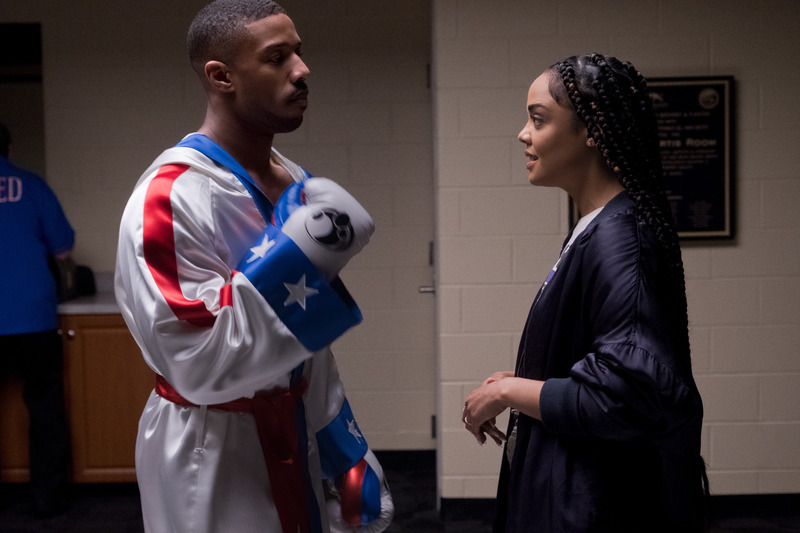 Passions turn epic for Adonis (Michael B. Jordan) and Bianca (Tessa Thompson) in Creed (2018). Image: Warner Bros.
Then, Creed II man’s up and square’s up with its fists up for a supremely entertaining, gripping and moving rest-of. Stallone’s Balboa, now fully recovered from the blood cancer that framed the first Creed (2015) movie has matured into a calm, soothing-voiced, almost God-like character, at least in the gyms and on the streets and hospital wards of Philadelphia, his native stomping ground. He’s more content throwing dough to make pizza at ‘Adrian’s’, his slice of Little Italy bistro named after his beloved, late wife, whom he has regular and touching catch-ups with in the local graveyard. He still has emotional-continence issues though. He still can’t quite say what he feels, despite all this cemetery chatter. Unwittingly, he sends Adonis to near-death to a fight with Viktor which Adonis, the smaller, civilised, more artful fighter will probably lose. Sins of the father (figure) and the son: Sylvester Stallone and Michael B. Jordan in Creed II (2018). Image: Warner Bros.
Balboa has been with Stallone almost the same length as his actual film career. The two have grown up alongside each other so it’s impossible to see – on screen at least – where one ends and the other begins. Judging his acting is a head-scratcher for the critic. On the one hand Stallone is superb. On the other, it’s like watching one of his home movies. For me at least, watching him here as an aged man, his thinning hair tightly combed, as a confident, highly intelligent actor is a delight. It’s a fantastic turn. He is now in an established, settled relationship with the supportive and strong Bianca (Tessa Thompson, fighting her own battle to get a decent performance in what is essentially a man’ movie). The boy has become the father (figure), hence the glaringly obvious parallels to those early Rocky movies. But Jordan has better dialogue than Stallone even gave himself and emerges as a much more interesting figure, someone with believable depth. Another actor from these craggy boxing films who has evolved, stunningly, is the craggy-faced Lundgren. His Ivan Drago (former catchphrase: “I will break you”), the icily determined Russian slayer of Balboa’s pal, a veritable killing machine, has long been on ice. Manning up, squaring up, fists up. 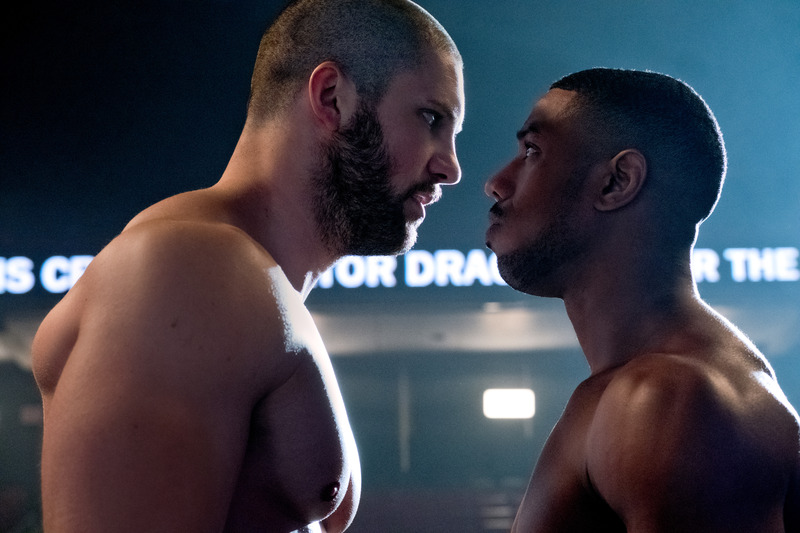 Viktor (Florian Munteanu) and Adonis (Michael B. Jordan in Creed II (2018). Image: Warner Bros. Cast into the wilderness after a memorable battering by Rocky on his home turf, his supermodel wife Ludmilla (Brigitte Nielsen) left him and their infant son for a wealthy oligarch, his rage and fury has manifested itself in the most horrible way – into his child. Steely eyed he has a sociopathic determination to continue destroying his American insulters through his son who is instructed to annihilate Creed’s seed – talk about the sins of the fathers! The discussion about how boxing has become so venal and garrolous neatly runs alongside the comparisons between the homely, nurturing, loving, humanistic Creeds and Balboa’s and the mechanically ruthless Drago’s. 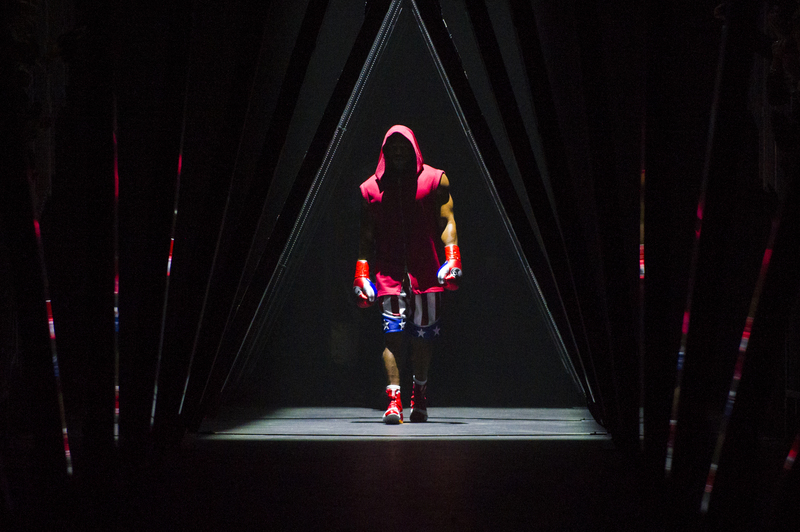 With Lundgren’s character, Creed II approaches, in a clumsy way perhaps, a boxing tragedy of Shakespearean proportions. He has raised a child, with singular emotional neglect – and God knows what physical cruelty – to become a man who “only knows (his fists and fighting)”. A terrifying and degraded character, even Ivan’s weepy conclusion doesn’t entirely redeem him, as later Ivan and Viktor jog alone, gearing up for some future bout. Nielsen, whose performance opposite Lundgren in then husband Stallone’s Rocky IV saw her voted as Worst Actress and Worst New Star at the Razzie’s, makes a slinky, reptilian cameo-return as the ambitious Ludmilla. Casually ignoring her son to his obvious distress, she knocks back a glass of champagne and heralds her ex-husband. 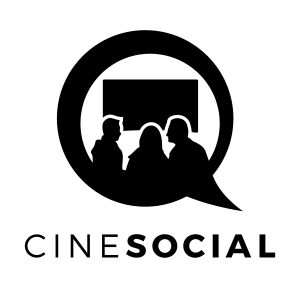 That dawdling side of Creed II creeps up on your every 20 minutes or so but, as with all boxing movies, the measure of success is in the gruelling, innovative training sequences (here, in a barren, scorched desert – a brilliant series of shots) that sets the audience up for an epic slugging out. Creed II does not disappoint and the camerawork and editing is second to none. Exhausted after the match? Christ, I needed an ice bath myself afterwards. Director: Steven Chaple Jr. 2hrs 8 minutes/128mins. MGM/New Line Cinema/Warner Bros./Chartoff-Winkler Productions. (12a). Producers: William Chartoff, Sylvester Stallone, Kevin King Templeton, Charles Winkler, David Winkler, Irwin Winkler. Michael B. Jordan, Sylvester Stallone, Tessa Thompson, Phylicia Rashad, Dolph Lundgren, Florian Munteanu, Russell Hornsby, Wood Harris, Brigitte Nielsen, Milo Ventimiglia.